CULVER, Ind. 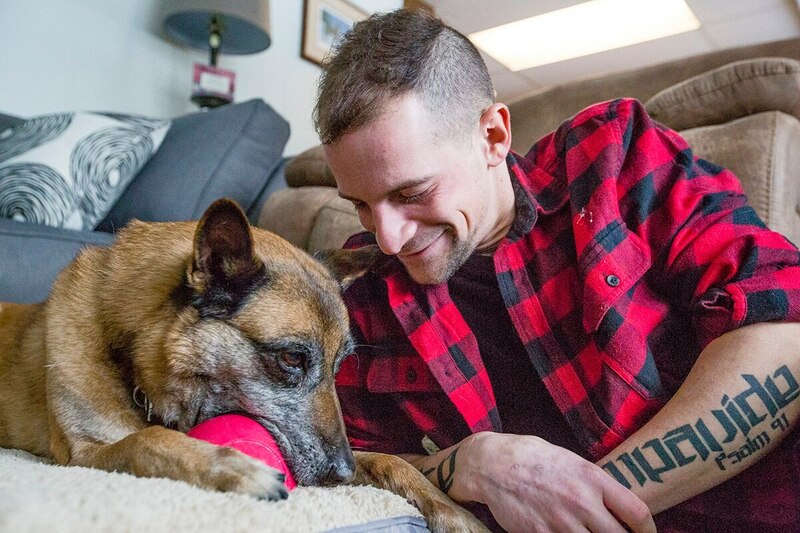 — An Indiana veteran recently adopted the bomb-sniffing dog he served with in Afghanistan, and he says the retired canine is settling in to a pampered life. The new red and blue "forever" stamps will feature a German shepherd, Labrador retriever, Belgian Malinois and Dutch shepherd. On Saturday, Steenbeke and his wife, Stephanie, returned home after picking up Tess in Newtown, Connecticut, the South Bend Tribune reported. The playful canine is now getting used to her new home in the northern Indiana town of Culver, about 30 miles (48 kilometers) south of South Bend. "We're just looking forward to giving her a good retirement life. She's worked so hard her entire life now she gets to sit back and have fun and live like an eccentric billionaire," Steenbeke said with a laugh. In the six years since they parted, Tess' muzzle has turned a bit gray, but Steenbeke said she is still energetic and loves to jump up to give him kisses. Tess' new favorite toy is a large, red ball she enjoys chewing while curled up on her dog bed. The adoption approval took lots of paperwork and help from family, friends, nonprofits and U.S. Rep. Jackie Walorski's office.